If you’ve not yet heard of Natasha Owens, you will. The worship leader/singer-songwriter from Dallas has been making music since she was three years old. 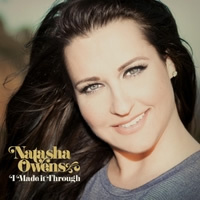 This year, she’s sharing a stage with Michael W. Smith and Jason Crabb and recently released a new project, I Made it Through. Capturing a journey of grief and redemptive peace, following the loss of her father, the project is inspiring and healing. CCM spoke with Natasha about her past, her pain and her peace. CCM: You’ve been singing singing practically since you could walk. How did you know or when did you know that God was calling you to use your gifts in a ministry capacity? I took the position; and, looking back on it, it was the best decision I could have made. God knew what I needed and was calling me into a ministry to help the brokenhearted. After I accepted the position, I entered into a long and very hard stage of anger. I was so mad at God for taking Dad. It was very hard for me to get up and motivate people into worship and tell them how great God was when I felt He was anything but great. I felt like such a hypocrite, and the guilt of that ate me up. In hindsight, every time I led worship, I found songs of restoration, songs of hope and love and the greatness of God. Those songs were the key to my healing. I really felt like God was calling me into another level of ministry, but I didn’t know what. I prayed that God would give me an answer and a sign as to what I was really being called to do for Him. The next morning, I received a text from a producer in Nashville that I had met a couple of times that simply stated: Have you ever thought about doing a CD? I immediately knew that the text was my answer from God. Since that day, God has opened up so many doors. CCM: What was it like learning that your father was not in this world any longer? NATASHA: In life, we have moments that happen so quickly and change our lives forever. This was one of those moments. Within the second of hearing of my dad’s death, I knew that life as I knew it would no longer exist. My life was forever changed, and I was left with a gaping hole that could never be filled. Time absolutely stood still for me. On that day in May, I began a road of survival, a road that began with pain, sadness, anger and suffering. But God continued to lead me down a path to healing, peace, joy and ministry. God showed me that I could not die in my circumstance, looking at what I had lost. I had to keep living for what I had left. I had a husband and two boys who needed me and a world filled with hurting people who needed to hear my survival story. When people go through something faith-shaking, they either get closer to or further away from God. My burden is to reach these people at their crossroad and give them hope to hang on until God can restore them — to get closer, not further away from God. CCM: The record has beautiful songs of restoration and hope. Was that hope easy to come by? NATASHA: No, that hope was not easy to come by. The road to recovery was long and was the hardest thing I have ever been through. But I came out on the other side so much stronger and with such a testimony. God never left me. He was with me every step of the way. I want people to feel and hear God, not my voice, in the music. CCM: How has it been to perform alongside Michael W. Smith and Jason Crabb? NATASHA: It is truly amazing to see Jason communicate with the audience. He is so humble and anointed, and it amazes me to see how he is able to connect to the crowd. He absolutely loves people, and it shows in every action and every word. And Michael W. Smith — what can be said about this legend? Michael W. Smith has made an indelible mark on Christian music, and his legacy will live on forever. To watch this man perform songs that he has written every night is a blessing, and I am honored that he would allow me to share the stage with him. 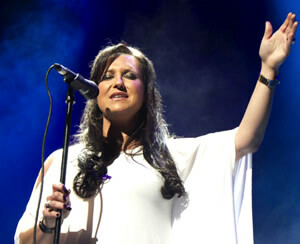 You can catch Natasha on the Summer leg of Jason Crabb’s Love Is Stronger Tour, and online at natashaowensmusic.com.